To meet market needs and effectively compete, organizations demand visibility, agility, and integration from their supply chains. On-premises SCM platforms simply can’t keep up—and leaders are leveraging the cloud to build more adaptable models. Supply Chain Leaders-Good supply chain management (SCM) is essential to your operational efficiency, customer centricity, compliance, carbon footprint, and ultimately your overall success. If handled correctly, your supply chain should improve customer service—along with the reputation of your brand—and boost your bottom line. But, as with many areas of business, the rules of the game are changing. What’s changing? Well, everything. New regulations, increased buyer expectations, shorter product lifecycles, fluctuations in demand, new market entrants, poor visibility of globalized supply chains—all these things, and more, are testing the limits of the traditional on-premises supply chain model. The simple truth is that the way things used to be done, and the solutions that enabled it, are no longer up to the job. Today, organizations need levels of flexibility, integration, and visibility beyond what on-premises systems were designed to deliver. The pace of change in business continues to accelerate—and shows no sign of slowing down. Customers expect more, products are introduced and updated more quickly than ever, and new companies enter the market daily. With so much to keep up with, a lack of agility and scalability can cost an organization dearly. On-premises supply chain management can add unnecessary expense to innovation, and often lack the flexibility needed to respond appropriately and quickly to a changing business landscape. In fact, it’s no exaggeration to say that supply chain rigidity may not just hinder growth, but can jeopardize an organization’s survival altogether. Many established organizations are finding that the demands of their supply chains are increasing as IT budgets are being reduced. Often, too much money is spent on maintenance and upgrades rather than driving innovation. And with on-premises solutions, upgrades and the ability to leverage emerging technologies can be time-consuming and expensive. The situation isn’t any easier for new businesses. The large upfront investments involved in building an effective supply chain can be daunting—or even out of reach. Today’s complex global supply chain also makes it more difficult to gain visibility into the many activities that make up your supply chain—visibility that’s essential for managing risk, reducing costs, and ensuring profitability. Without complete, accurate, real-time visibility, almost every area of your business can be affected, from product design and production costs, to quality, compliance, and customer satisfaction. What’s needed is a new approach: a new way of driving innovation and differentiation, and a new way of delivering solutions that can be scaled up based on incremental value and business need. 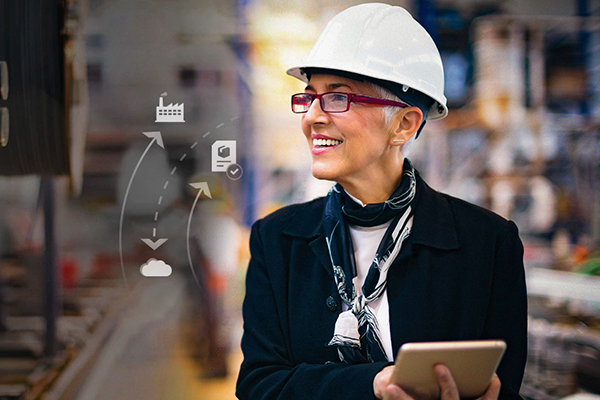 Due to the shortcomings of rigid legacy on-premises applications, supply chain innovators are moving toward building a modern, flexible, end-to-end supply chain that’s more suited to the dynamic challenges of today’s business environment. Ultimately, this means a move to the cloud. In fact, IDC’s 2018 Supply Chain Survey found that 75% of companies felt that the cloud was critical to delivering supply chain excellence both today and into the future. Cloud-based SCM provides a wealth of benefits, including low upfront investment, secure access, faster deployments, simplified integration, continuous upgrades, and effortless scalability. Agility: Modern end-to-end supply chains offer greater scalability and agility—with more IT flexibility to allow for easier expansion and contraction. The ability to respond to rapidly changing demands is essential for the modern business, and supply chain management in the cloud enables you to quickly and securely deploy new services and capabilities, and easily scale to meet demand. The post Why Supply Chain Leaders Are Moving to the Cloud appeared first on erpinnews.